Thank you for joining me as we count down to the next MFT release. We are four days away from the big day! All the new Stamps, Die-namics, and Stencils will be available on Tuesday, March 1 at 10:00 pm EST. Be sure to check out the MFT Blog to see all the new items being revealed today. Don't forget to leave a comment on the MFT Blog countdown posts, YOU could win one of the five $75.00 gift vouchers. I have a really fun card to share with you today, it features the new Prehistoric Fun stamp set and Die-namics. This set is full of fun images and sentiments. Your first thought might be that it is perfect for cards for kids, but it is actually far more versatile than that. I took the plunge and played with the new Prima Watercolors when making this card. I love how pigmented these watercolors are! I definitely need some practice, but I really enjoyed using them. 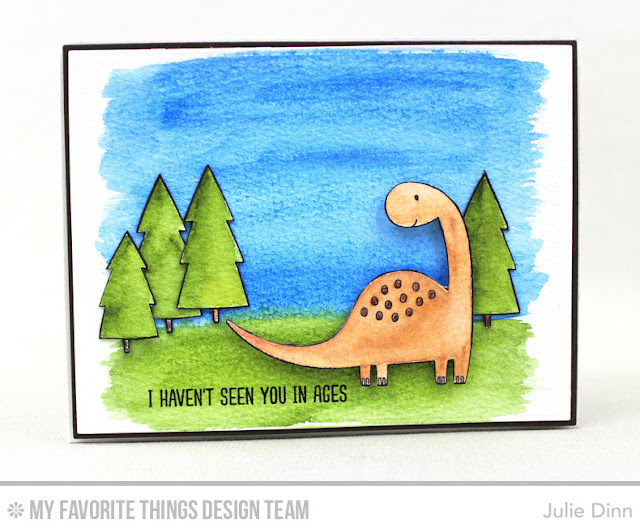 The Prehistoric Fun stamp set is full of fun greetings like the one that I used on this card. What a fun stamp set, and your card came out so cute! Cute card. I love the sentiment with the dinosaur ..puts a smile on my face. Beautiful watercolors that really highlight the dino! Great sentiment on a cute card!!! What a really fun sentiment on your card! Thanks for sharing your ideas with us. That is a darling card design. Sure to make anyone smile! This set is growing on me. Really cute. Great card. Love the scene. Fun, I do love the bright colors you got from those Prima water colors! Very nice dinosaur card, love the watercolor background.